Cisco Systems offers several expansion modules (e.g. model 7615) for their phones for when a need arises to expand your business. Plantronics offers a complete line of wireless headsets for Cisco phones and several Electronic Hook Switch (EHS) cords for select Cisco models that will allow you to answer and end calls remotely without having to use a handset lifter. However, when you use an expansion module, one of the jacks on the bottom of the phone that is used by the EHS cable is taken up by the module’s connecting cable. When you reconnect the EHS cable to the expansion module, the part of the cable that goes into the headset jack on the phone is too short. Enter the Plantronics adapter cable, 85638-01 (formerly 40287-05). 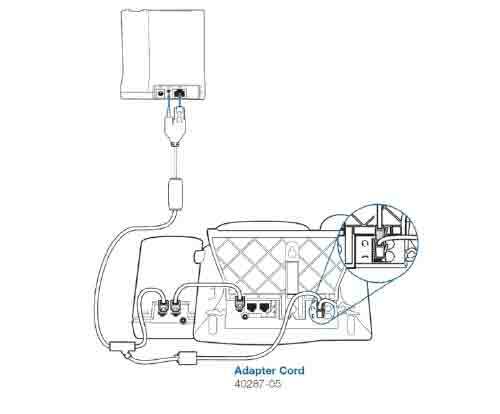 The illustration below shows how this adapter cable can provide the length you need to reach the headset jack on the phone once the expansion module is added. If you add another expansion module, you add another adapter cable, and so forth. This provides a simple, yet effective, way to continue using the Plantronics EHS cable for answering calls away from your desk and not have to revert back to using the handset lifter.